I'm a bit of a Stargazer, for me there is nothing more relaxing than sitting watching the stars, especially if you have a telescope (and a cider or 2). I've been trying to take photos using the scope for a while but not really had too much luck, as there is a blue moon at the moment I thought I would have another go, I seem to have had a bit of a breakthrough! I'm really happy with the way its turned out and felt like I wanted to share with you guys. Its supposed to be another clear night tonight too, I'm going to try to grab a shot of Saturn if I can, its absolutely stunning at the moment. I've recently started with the stargazing lark with binoculars and then last month bought a cheapo telescope from Currys for £59. With the bins I have seen 3 of Jupiters moons and with the scope I have observed Saturns rings. Not sure why people observe the Moon as its always there and never changes although a waxing/waning moon is better than a full moon as the shadows make the craters easier to see. Now I'm not really sure if theres anything else out there that I'm keen to see. I do get what you are saying although I love looking at the moon. Because of the magnification levels and the light conditions astro photography is hard, all the advice I have been given is to start with the moon then work up to planets. I'll try and have a peek at m42 next time I get the scope out. I have trouble with the finderscope to know for sure what I have the scope trained on, obviously you dont have that problem with the moon. I can make out Jupiters spot and rings fairly clearly, if you can see Saturns rings then you should be able to make out Jupiters spot. My scope wasn't expensive either, about £100 from Jessops (a Skywatcher 130-900), although it is a reflector type and fairly powerful. A barlow lens is a fairly cheap way of improving the magnification too, they sit inline with the normal eyepiece and double or triple the magnification depending on the lens. Do you use an app on your phone to help find things? I find StarTracker to be the most accurate one I have tried, it really helps pick things out. 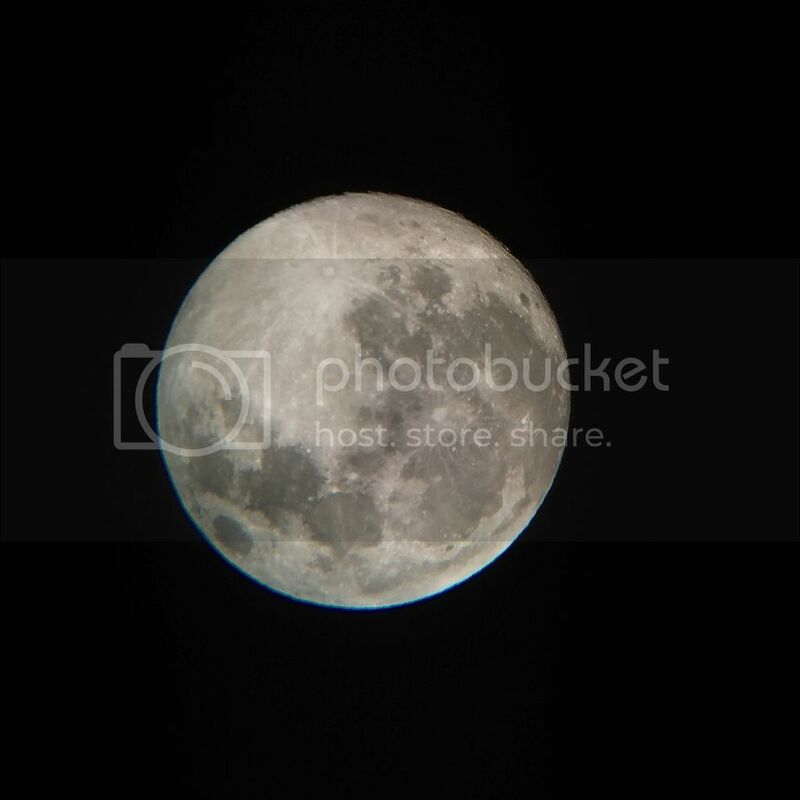 Fantastic picture of the moon, well done, and good luck with any more that you take of anything in the night sky, I for one would be really pleased to see anything you manage to capture so don't be afraid to post on here. I am a totally mad fan of the night sky, have been since 1972, and can never tire from looking up at the stars and planets. I'm more of a naked eye observer nowadays, though still do hanker after a 8 inch Newtonian Reflector. I have had a 'scope in the past and the sight of Saturns rings in "real life" is quite, for me anyway, awesome. I would also not tire of observing the moon, every phase offers subtle lighting changes that alter the whole landscape, and given our climate it can be few and far between when we see these phases. Clusters, planets, moons, variables, rotating variables, comets, there's so much out there to interest me. Cheers bud, I'm really happy with the way it turned out. I use the jodrel bank website too, it gives you a great idea of what is viewable and when. I just can't get enough of anything to do with Space, I've been fascinated by it since I was a kid. Did you get any of the blood moon? Seen a Super Moon, seen a red moon, but couldn't be bothered to get up to see a Super Red Moon as I was up early for a ride, just as well I didn't bother as my son said it didn't go red here.